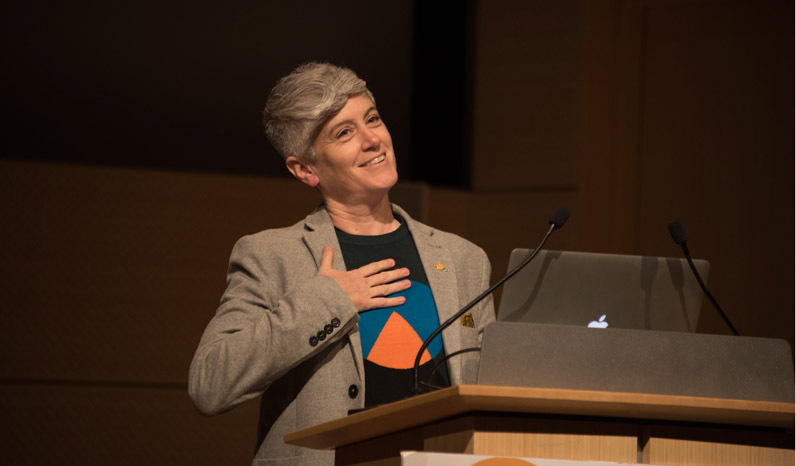 Colleen Macklin, Associate Professor of Media Design in the School of Art, Media, and Technology, was a Keynote Speaker. Committed to innovation, academic freedom and experimentation, The New School was an ideal venue for this year’s New York City Regional Scholastic Awards. Held at the Tishman Auditorium with a reception after at the Sheila C. Johnson Design Center, the awards recognized creative young people in grades 7 through 12 in the areas of arts and writing. Experts from Parsons School of Design and Eugene Lang College were recruited to serve as judges for the competition. Keynote speakers for the award ceremony included Colleen Macklin, Anne Gaines, recent Lang graduate Emily Skillings and Stephanie Browner, dean of Lang. Approximately 5-7% of all regional submissions are recognized with Gold Key Awards, while 7–10% of all regional submissions are recognized with Silver Key Awards. See photos of students accepting their awards here. Lang hosts a summer intensive writing workshop for students in grades 7-12, with a focus on developing your own voice. This summer’s course will tackle the issue of personal and locational identity. Learn more about the program here.